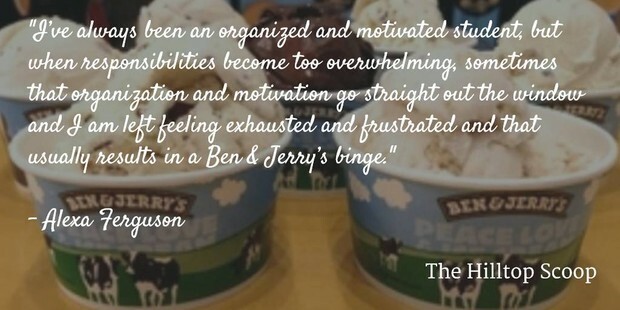 New Blog Posts on The Hilltop Scoop! 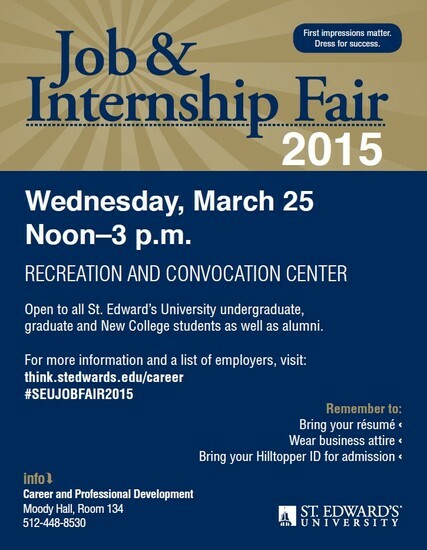 Don't forget to bring your suit for the Job & Internship Fair! 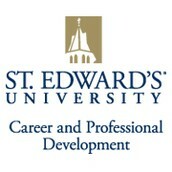 For information on attending employers and other helpful bits of information, please visit http://think.stedwards.edu/career/spring-job-internship-fair-2015. 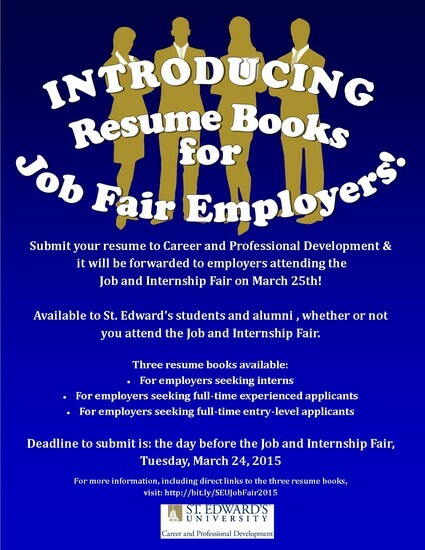 Introducing a new feature of the Job and Internship Fair: Resume Books! 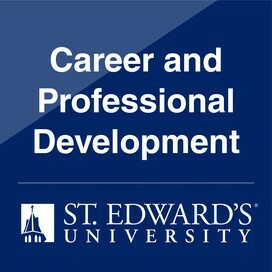 Students and alumni are now able to submit their resume to the office of Career and Professional Development who will in turn forward your resume(s) to employer recruiters attending the Job and Internship Fair. You can submit your resume whether or not you will be attending the event, and you can submit a resume to one or more of the resume books. 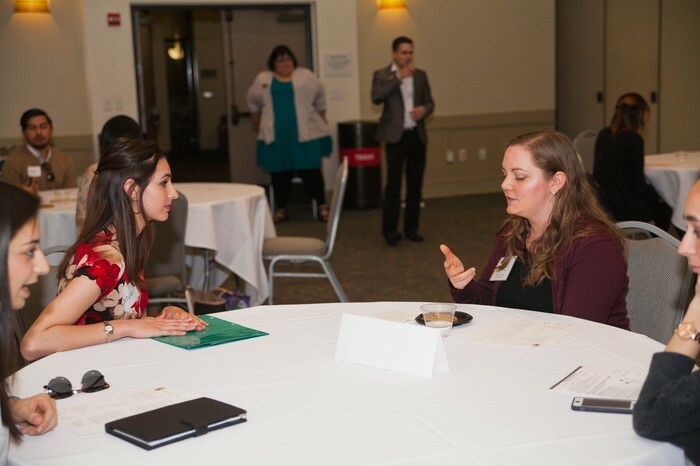 There are three separate resume books for the Job and Internship Fair: one is for employers seeking interns, another is for employers seeking full-time experienced applicants, and a third is for employers seeking full-time entry-level applicants. After the Job and Internship Fair, all resumes submitted will be sent to the Job and Internship Fair employers. The DEADLINE to submit your resume(s) to any of the job fair resume books is the day before the event, March 24, Tuesday, 2015. Below are the links to the three resume books. Please note that the resume submission site is in Hilltop Careers, St. Edward's job and internship database for students and alumni. The resume books are located in the Career Events section of Hilltop Careers. The links below will take you straight to the resume book submission site. If you are a previous and recent user of Hilltop Careers, when you click on the link to submit your resume, you will be asked to log in to Hilltop Careers. If you have never used Hilltop Careers or don't remember your log-in information, at the bottom of the Hilltop Careers log-in page, you will click on "I can't access my account." Further explanation is given on the sign-in page. 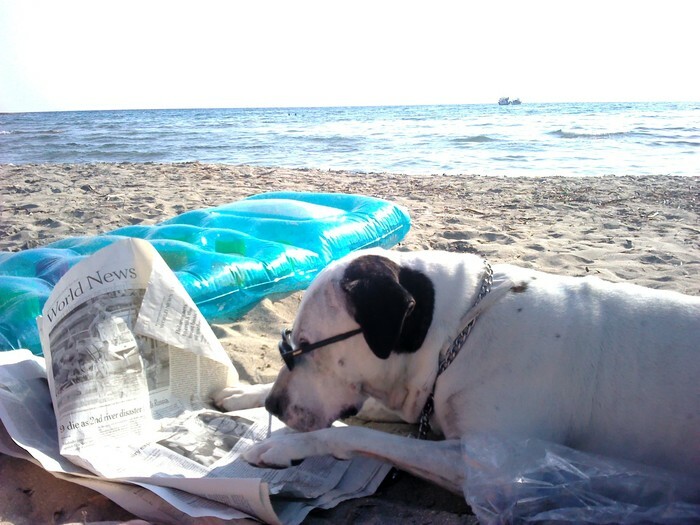 Subscribe to The Hilltop Scoop Today! 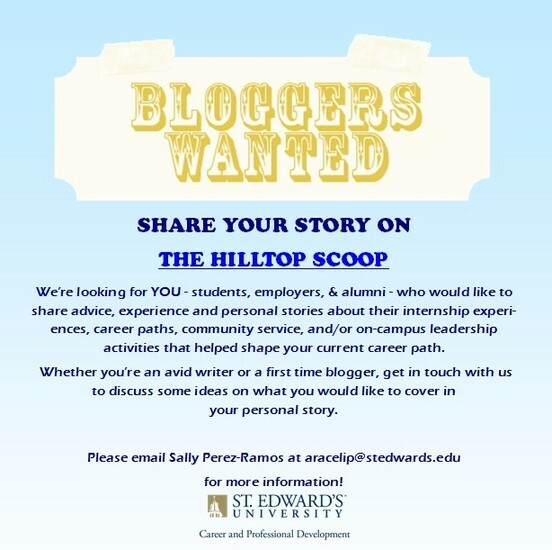 Don't miss out our new blog, The Hilltop Scoop, by subscribing at http://sites.stedwards.edu/seucareer! 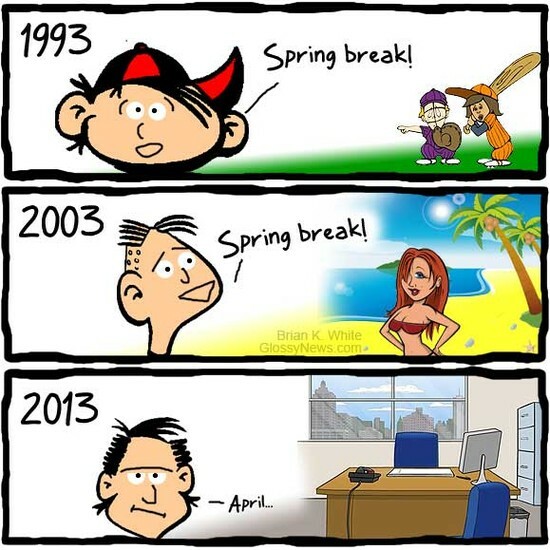 As its Spring Break, the Workshops are on hiatus. 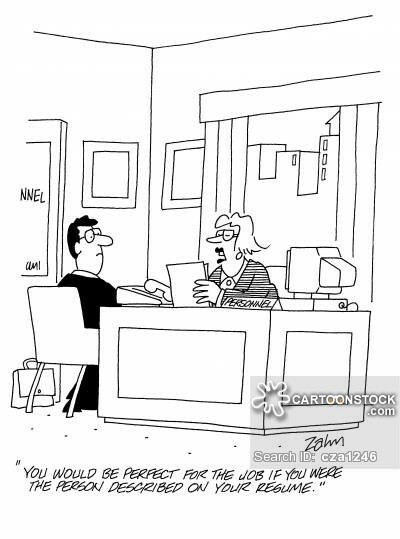 But the office is still open so please stop by and visit us to answer all your career development needs! How to Work a Career Fair at 4:00 p.m. Here you'll find tips on how to prepare for any job fair but specifically for the Job and Internship Fair hosted by our office. 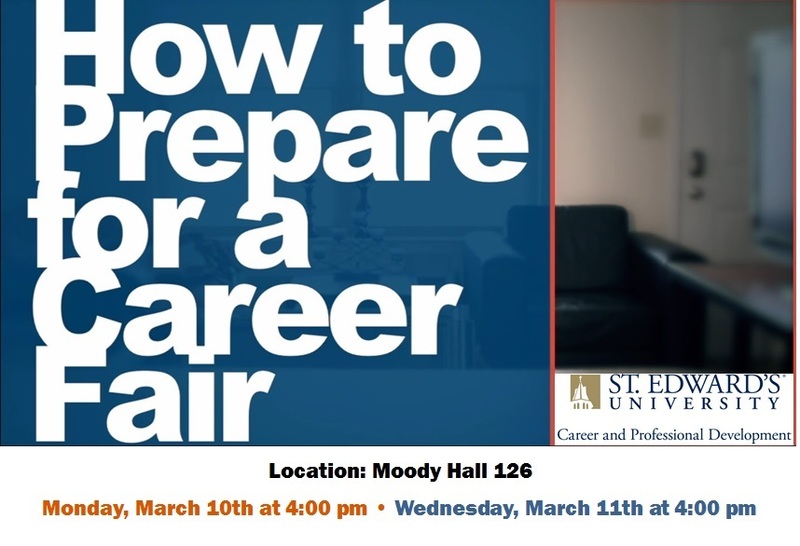 Learn how to prepare for the job fair, what to expect, and how to follow up on leads from the fair. 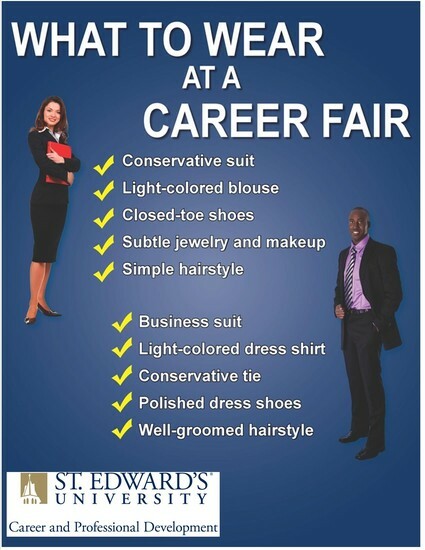 Get the most out of any career or job fair! Resume Workshop - 5:00 p.m. This workshop will assist you in developing a resume from scratch or polishing the one you currently have. 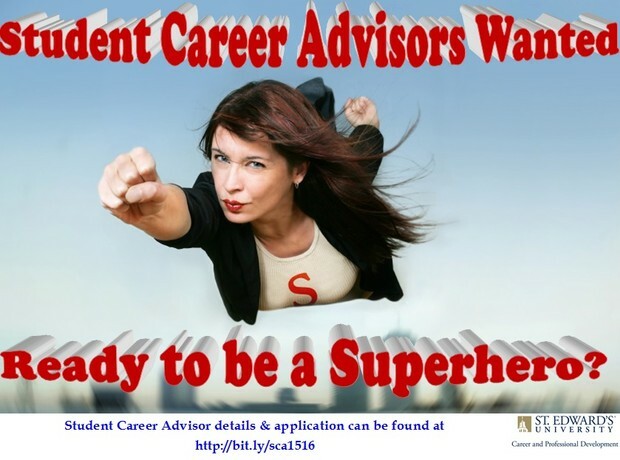 This workshop is strongly recommended for ALL students as they begin the job search process. 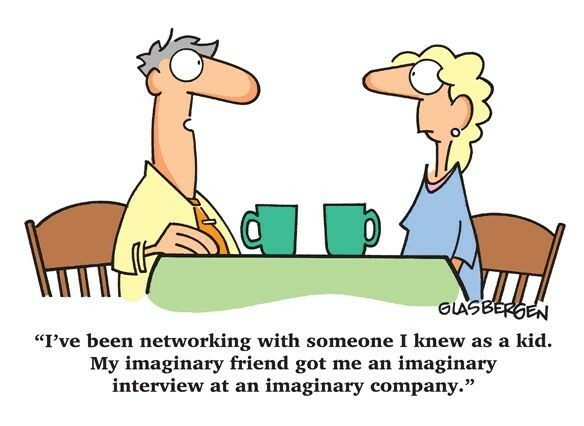 Resume Workshop - 4:00 p.m.
Jump Start Your Internship Search Workshop - 5:00 p.m. This workshop is designed to explain what internships are, help answer your questions, discuss the required steps to get involved, and assist you in filling out the appropriate paperwork. Come to find out what we can do to help you land an internship as well as to learn more about finding or developing an internship on your own. For more internship opportunities, visit Hilltop Careers!